The extraordinary life of the brilliant pianist and virtuoso comedian Victor Borge “the funniest man in the world” (NY Times) is retold and his hilarious act re-imagined for the 21st century. 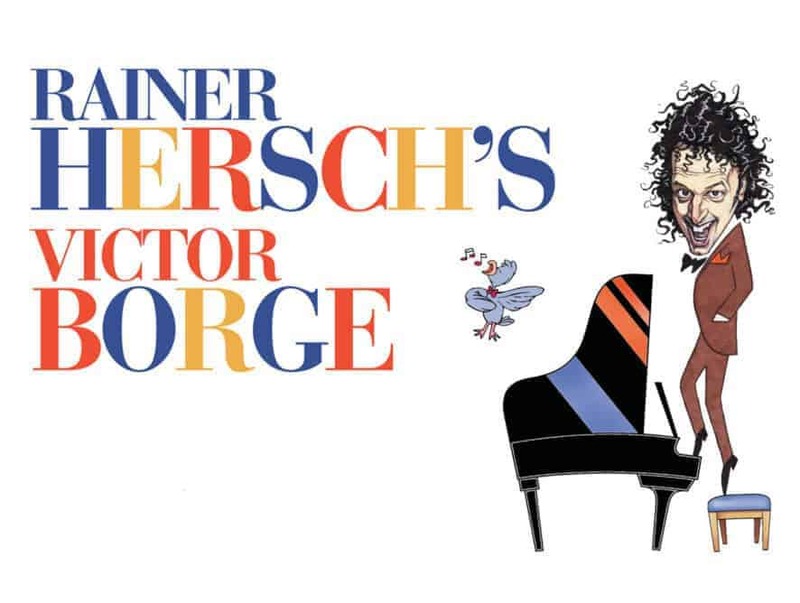 Reigniting the Borge magic, Rainer is joined on stage by BBC Proms solo pianist, Danny Driver and Royal Opera House soprano, Soprano Kristy Swift. 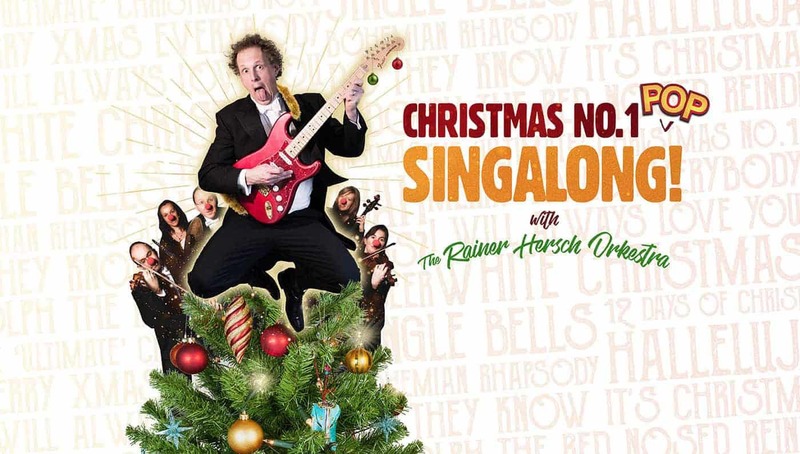 Rainer and his Orkestra hit this classic live-music venue with a Yuletide treat: a jamboree of classic UK Singles-Chart Christmas No.1’s. Hilarious comic entertainment all served up with award-winning vocalists featuring vocalists Jessica Daley (Maria from the ‘Sound of Music’) and Graham Foote (‘Jersey Boys). Following two sellout years and some incredible hi-jinx, Rainer Hersch and the Orkestra return to Cadogan Hall to welcome 2019 with an unforgettable evening of laughter and fab music. It’s a brand new dollop of games, tricks and jokes for conductor, orchestra and audience plus guests from the world of music and comedy. Absolutely not to be missed. Is Mr Hersch ever planning or thinking of coming to Atlanta Georgia? Rainer would love to come to the US but dos not have any plans (or offers!) to visit the US at the moment. However, we thank you for your interest and support. Please join his mailing list and, if things change, you will be the first to know. Susanna Gould for Rainer Hersch. If we were able to find a venue that wanted to host him, would he be willing to come? And does it matter what type or how prestigious the venue? Of course nothing too ordinary or “rundown” but would a university or church be okay? I really want to bring him over to California, U.S. now that I have seen his videos! He is amazing and I know so many people here would love him too! I have some ideas of places he could play, email me if he is interested, because I am! Lol. Sure! Please contact Susannagould@masterpiece.me.uk with any proposal. Look forward to hearing from you. We need humor badly here in America. Please come to Boston!!!! Second the above on Boston. What a great reception he would get here! I cannot believe he has had no offers from the States. Honestly, I had never heard of him til I discovered him on YouTube. Now, I can’t stop watching…. Please consider Houston, Texas. I just discovered your video’s on YouTube also. I’m sitting here out in the shop, laughing out loud when the Supervisor walks up and wants to know whats going on. I show him, and now he wants to watch the next video. Second on the above for Boston. He would pack them in here. Can’t believe no offers from the States. Australia, please! Particularly Melbourne – I will arrange the venue and put him up in my spare room if necessary. Come to Connecticut or New York!!!! Rainer will be at the Kurhaus Göggingen on 5th January. Information on the web site. Also, near you, in Reutlingen with orchestra at the end of February for a Faschingskonzert. See you there! Any shows planned in Norway? Not at the moment. We don’t have any contacts in Norway and haven’t received an invitation. Maybe someday soon. Thanks for your support. The Rainer Hersch team. I am a very big fan of Rainer and would love to see him in Denmark soon, the home-country of Victor Borge. I have just discovered Rainer Hersch on the internet. What a talent and joy for all ages, though especially a wonderful way to introduce children to this type of music. Great music and comedy mixture. Would love to see him tour Australia. Many years ago took my then young children, to a Victor Borge concert here in Brisbane when he visited Australia and have always been a fan. Will continue to enjoy the music and comedy of Rainer Hersch and his orchestra via the internet and maybe one day in person. My daughter is going to school in Indianapolis, Indiana and discovered your videos. She brought it home and all we could do was laugh. We love orchestras, Transiberian Orchestra is here every Christmas, and we would love to see you. Dear Terrence – thank you for your comment. It is much appreciated as are all comments to this site. Rainer is really happy if his performances have brought you pleasure. He is a unique talent.